Nicole Freedman led a winter ride along West Fourth Street in South Boston in late 2013. 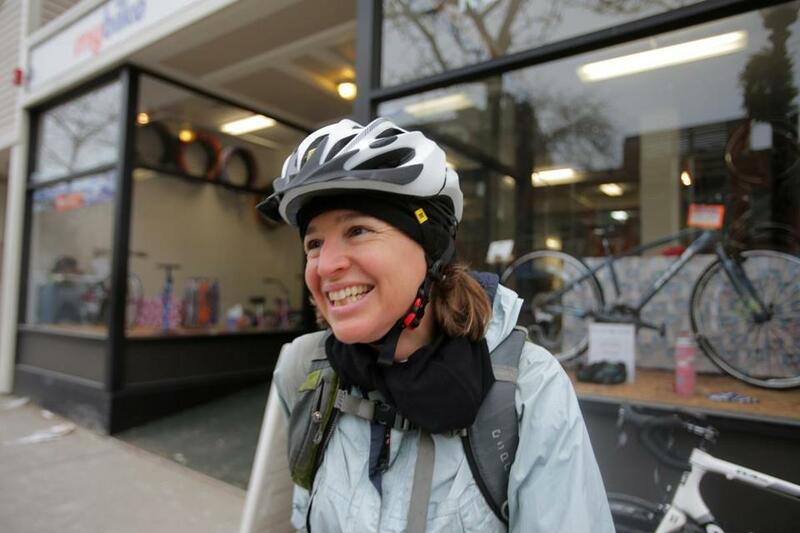 Nicole Freedman, the director of Boston’s bicycle programs, is leaving the Northeast for the Pacific Northwest after nearly seven years of working to make the city more bike-friendly. She announced on Friday that she will be moving to Seattle to help lead its major transportation initiatives, including the bike-sharing system. Freedman, a Wellesley native and former Olympic bicyclist, has been widely credited with changing the culture of cycling in Boston, often considered unsafe and unpopular among bikers. Freedman helped launch the Boston Bikes program under Mayor Thomas Menino in 2007. Under her leadership, the city created 92 miles of bike lanes and implemented a successful bike-share system, Hubway. Riders who purchased the monthly fare likely had no idea they would have to contend with a series of snow-related delays and shutdowns. Pete Stidman, director of the Boston Cyclists Union, said Freedman managed to build a “whole raft of programs” with few resources. “She was in the right place and in the right time, and she was the right person,” he said. Mayor Martin J. Walsh said in a prepared statement that Freedman was “critical to elevating cycling in the culture” of Boston, and that she leaves behind a lasting impact on the city’s bike programs and infrastructure. In a goodbye note that she e-mailed to a city government mailing list, Freedman said she was proud of how much her department had accomplished. She also hinted that good news would be coming for bicyclists who regularly travel Commonwealth Avenue. The thoroughfare’s bustling stretch near Boston University has been known as a dangerous area for bicyclists. Advocates have been pushing to install a cycle track — a lane with a physical barrier between cars and bikes — in the area, particularly after a truck struck and killed a bicyclist there in 2012. The city will make an announcement on its plans for Commonwealth Avenue on Tuesday; Freedman’s last day on the job is Friday. Frank DePaola has taken over as interim general manager of the Massachusetts Bay Transportation Authority, but outgoing chief Beverly A. Scott isn’t out of the picture — or off of the payroll — just yet. Scott told officials that she planned to stay on until April 11. Though DePaola took over the agency on March 4, the T will continue paying Scott her regular salary of $8,461.54 every two weeks until her departure date. MBTA spokesman Joe Pesaturo said Scott is helping outside groups, such as the Federal Transit Administration and the American Public Transportation Association, that are looking into the T’s response to the snowiest winter in Boston history, which crippled the system for weeks. Scott is also assisting DePaola in the transition, he said. Since Scott took over the job as general manager in December 2012, she has earned an annual salary of about $220,000. With the MBTA under fire for its dismal performance after a series of snowstorms in January and February, Scott on Feb. 11 abruptly announced plans to resign. Two weeks later, the state Department of Transportation’s board of directors voted to appoint DePaola, the agency’s highway administrator and chief operating officer, as the T’s interim general manager. How many commuter rail trains really ran on time last month? MBTA officials initially said 35 percent of the trains ran on time in February, when the transit system was crippled by a series of snowstorms. After looking closer at the figures, the MBTA amended its report, saying 32.6 percent actually kept on schedule. However, the revised figure also leaves out many trains that were canceled altogether. After one blizzard, the transit agency suspended the service for roughly 2½ days, which meant 790 train trips were skipped, according to its data. And for half of the month, Keolis Commuter Services, which runs the system for the T, operated on a drastically reduced schedule after many trains broke down during the snowstorms. Under the pared down schedule, the company canceled 18 percent of the trips that could have run when the MBTA was open for business. Factoring in the cancellations, about 73 percent of the regularly scheduled trains last month were late or never ran at all on the days that the T was operating. Leslie Aun, a Keolis spokeswoman, said the company knows the numbers were not where it wanted them to be. The company has promised to restore full service by March 30. On Monday, the company will be operating at least 87 percent of its regularly scheduled trains, with more trains running every day, Aun said.